So you don’t have Direct TV or you don’t want to drop $300 for the NFL Sunday Ticket (or $350 for NFL Sunday Ticket to go). Well, then you are out of luck when it comes to getting live TV broadcasts of every NFL game. That remains the exclusive right of DirecTV, at least through the end of the 2014 season. If you just want to be able to watch your favorite NFL teams and don’t mind waiting until the next day, NFL Game Rewind may be your solution. 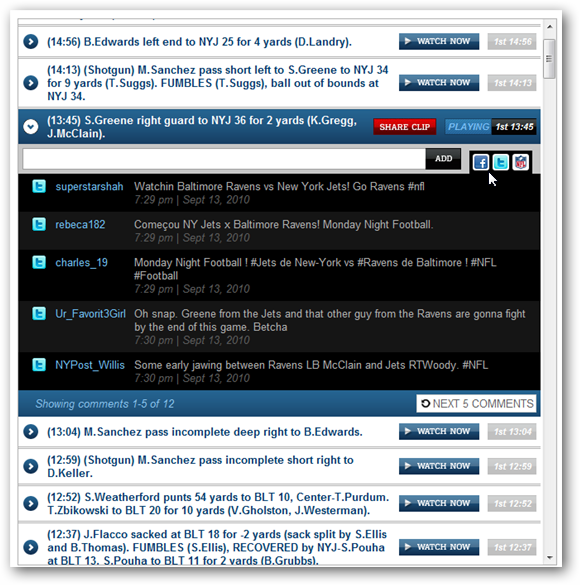 UPDATE (8/10/2011) : Check out our updated review of the 2011 edition of NFL Game Rewind. OK, so it’s not the same as watching it live. That’s a given. 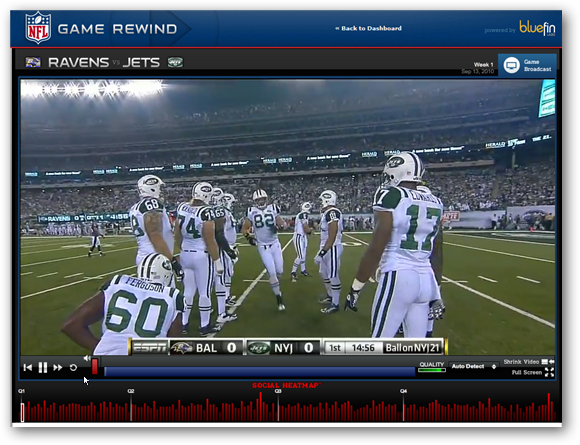 But for what it is, which is on demand video of every NFL game, Game Rewind delivers a very strong product. Each game is available starting the next day with commercials and halftime breaks removed. The video is the actual network footage, so you get the same video and announcers as the television broadcast. The video quality is excellent for online and the on screen controls make it easy to pause, skip forward or back, and even play in Full Screen mode. 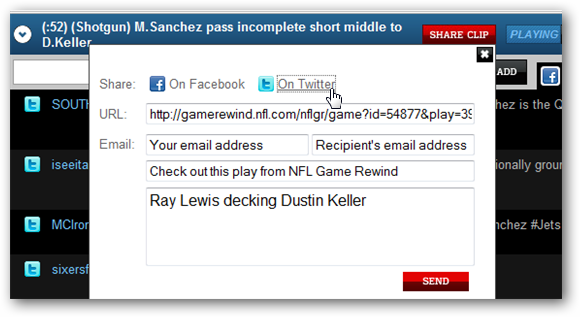 Social Media is everywhere and Game Rewind has added social media components for 2010. There is a Social Heatmap below the Game Rewind video that visually depicts the most popular plays of the game. It’s divided up by quarters in a linear fashion so you can more easily find specific plays. Move you mouse along the heatmap to find specific plays. Click on any bar to move the video playback to that play. You can also find and jump to specific plays below the Game Rewind Video. Scroll through the play by play of the entire game. If you have Auto-Scrolling enabled, the play by play will advance automatically. You can share any clip of any play in the game through Facebook, Twitter, or email. Find your play and click Share clip. Choose Facebook or Twitter, or enter an email address and an optional brief message to send it to friend by email. You’ll be prompted to sign into Twitter or Facebook and post your clip and message. The recipient will be able to view the clip you sent without signing up for Game Rewind, but will need to register (obviously) for full access. The viewing experience is similar to previous seasons, but the layout is different. When you log, you’ll see the games of the past week. Each games should be available the day after it is played. You’ll notice that each game has a Social Media meter to the right. This indicates which games had more social media “buzz.” You’ll notice the high profile Cowboys-Redskins game tops off the meter, while lower profile games such as the Browns and Bucs are much lower. Just click on any of the games to begin playback. To find a game, you can sort by week or team. You may notice there is even an option to sort by Season. 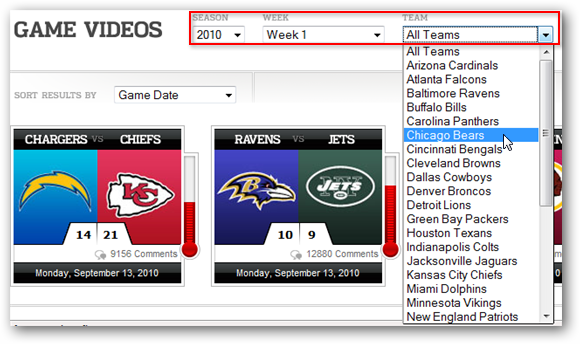 You can also view every game from 2009, which includes all playoff games and Super Bowl 44. The 2009 games are launched in a separate browser window and lack the Social Media components that have been added for 2010. Once you begin a game. The controls, which are only displayed when you mouse over the video, allow you to Pause / Play and skip back or forward by 10 seconds. It’s a bit confusing because the first button Starts the game over, rather than skip back as you may expect. A broadband internet connection (DSL/cable or higher) of 750 kbps or higher is needed for NFL Game Rewind. If you have an internet connection speed of 2.0 Mbps or higher and your computer meets the requirements below, you will be able to enjoy NFL Game Rewind at its highest video quality. Video adapter and monitor: Super VGA (1024×768) or higher. NFL Game rewind is UNAVAILABLE DURING LIVE NFL GAME BROADCASTS. Yes, that means you can’t watch NFL Game Rewind on Sunday afternoons, Monday nights, or Thursday nights when there is a Thursday night game. Watching on Multiple PCs at the same time with the same account is restricted. 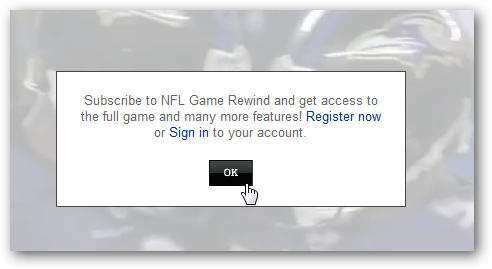 NFL Game Rewind is only available in the United States. UPDATE (9/10/2011) Check out our 2011 Game Rewind Review for updated info and features for Game Rewind. It should go without saying (but I’ll say it anyway) that watching live is much preferred. That being said, NFL Game Rewind may be the next best thing. Having all the commercials removed allows you to watch a game in less than 2 hours rather than 3 or more hours for a live game. 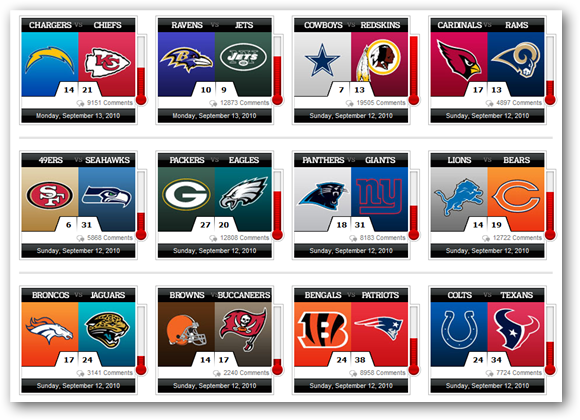 Unlike the NFL Preseason Live package, however, you can only view one game at a time. All games are available the next morning by 6am Eastern, with the exception of night games which are available by noon the next day. The quality is excellent (assuming you have the bandwidth). At times the picture may be pixilated if the bandwidth drops, but typically only lasts a few seconds. It still looks good when watching it through my modest 26” TV. The $49.99 price tag may keep many folks away, but it seems rather reasonable when compared to the price of the NFL Sunday Ticket. This is the second year that I’ve purchased Game Rewind as I am a big enough NFL geek to prefer watching games I’ve missed over whatever the networks are throwing on TV during a normal week. NFL.com did lower the price during the middle of season last year, but that doesn’t necessarily mean they will again. If you are unsure about a full year commitment, you may want to try it for a month for $14.99. If you can’t get DirectTV where you live, but still want to see games live you may want to consider NFL Sunday Ticket To Go. Fore more details, or to purchase Game Rewind, check out Game Rewind at NFL.com.